Business professionals love projectors. Not only are they integral in most business meetings and conferences but they are also convenient and great pieces of tech to have handy. Technology makers are starting to realize that business professionals are using projectors more frequently and have started integrating them into things like cell phones and laptops. While cell phone and laptop projectors are becoming more and more common, technology creators are looking for new ways to make projectors easy to use and more accessible and convenient. 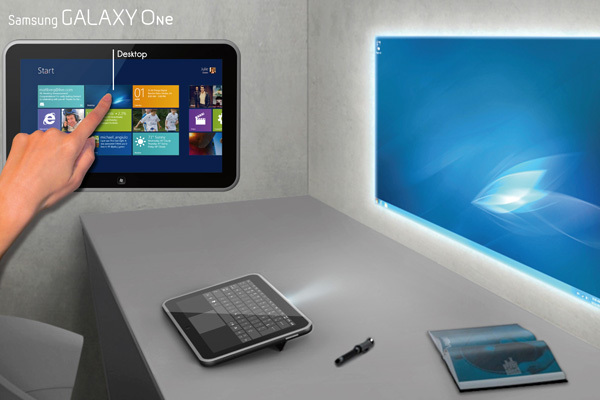 That is why Samsung has announced the Samsung Galaxy One, a concept Windows 8 tablet that comes with an integrated projector. For the time being, the Samsung Galaxy One is just a concept, which means it may or may not happen. However, this is definitely a unique idea and something that Samsung should seriously look into. The ability to use the full touchscreen of the tablet while simultaneously projecting and editing is something that many business professionals would probably be interested in. The designers behind the Samsung Galaxy One have made special use of a variable-angle projector that is able to be used with the tablet positioned in a variety of different positions. In addition to that, the Samsung Galaxy One has two built-in stands, which means it can manage a 10-degree angle or a 25-degree angle. The Samsung Galaxy One, if it even comes out, will also come with a stylus as well as a 14 mm aluminum body. Overall, the concept is fantastic. Having a projector in a tablet is the ultimate form of portability and performance. This is perfect for business professionals who constantly travel or give presentations. I really hope this gets off the ground and it’s up to Samsung to make it happen. I’m sure if the Samsung Galaxy One doesn’t take off, another device similar to it will come along in no time. InFocus just unveiled its newest product, the IN2120 series. The IN2120 series is a set of network projectors that the company is describing as “ultra-affordable” and “network-ready”. The IN2120 series brings with it the new IN2124 and IN2126, both of which feature sharp, bright images and advanced networking capabilities that are perfect for large conference rooms or classrooms. Both of these projectors can be controlled remotely over the network using a browser, which makes them very easy to monitor and flexible for a plethora of uses, like displaying emergency announcements. These projectors are also compatible with ProjectorNet 3.0 and InFocus’ free asset management software which enables you to schedule automatic power-downs and also receive instant email notifications for things like low lamp life or theft prevention if your projector suddenly goes offline. In addition to that, these projectors are packed with connectivity options that allow users to project great presentations from PCs, Macs, video sources, tablets and smartphones. Each projector also comes with a high 4,000:1 contrast ratio and features DLP technology with InFocus BrilliantColor and 3,200 lumens of brightness. These projectors are also 3D ready, which allows you to spice up your business presentations whenever you need. These devices are highly-portable, allowing you to transfer them between conference rooms with ease. The projectors can work wirelessly if need be when connected to the optional InFocus LiteShow III wireless adapter, which allows you to quickly transmit data, audio and video over a secure wireless connection within a 300-foot range. Finally, the IN2124 and IN2126 are easy to use as they both include preset modes that allow you to quickly optimize image quality on a number of different surfaces. Both projectors in the IN2120 series are rated for 24/7 operation and are easy to maintain with absolutely no filters to replace and long-lasting lamps that are easily replaced. Christie debuted its new LX501 and LX601i projectors at the National Association of Broadcasters (NAB) Show in Las Vegas today, both of which are the first devices in Christie’s new 3LCD product line. Both projectors offer high lumen outputs as well as features that make them great for professional settings. The LX501 is a 5,000 lumen XGA projector that comes complete with a 1,024 x 768 resolution with a 3,000:1 contrast ratio. In addition to that, the LX501 is designed specifically for small to medium-sized venues, which makes it perfect for use in higher education, corporate environments or government agencies. The new LX601i is a professional grade XGA projector that outputs 6,000 lumens and is perfect for similar situations that may require increased brightness. This projector also has features that simplify integration during setup and troubleshooting while also providing a quick and easy messaging display for users. With this new platform, Christie also plans on introducing a hybrid filter rated up to 20,000 hours that has absolutely no moving parts. This would reduce the need to change filters frequently as well as long-life lamps, further decreasing your overall cost of ownership. 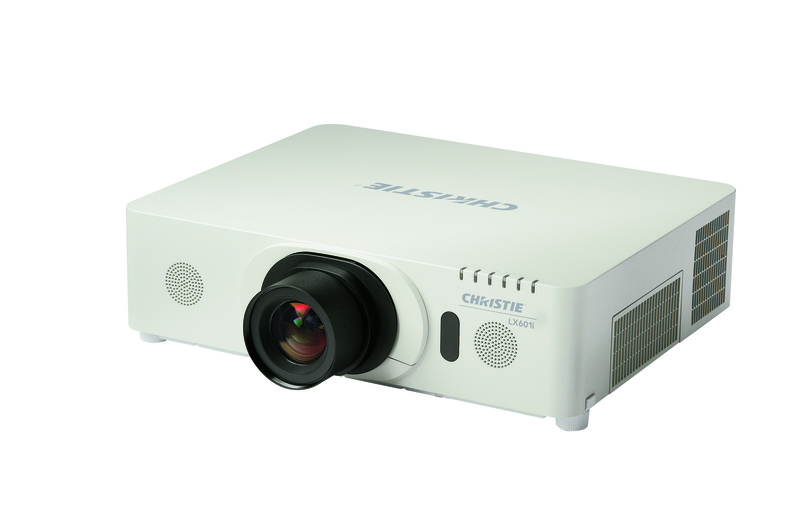 Both the Christie LX501 and Christie LX601i 3LCD projectors should ship sometime in May 2012. Just under one month ago, Samsung released the Beam, a small smartphone running Android 2.3 that comes with a built-in projector capable of projecting a 50″ high-definition image. While its power may not be substantial, its ability to quickly project something directly from your smartphone has benefits, especially in a small meeting setting where you could easily post quick information directly from the internet. What may surprise you is that this isn’t the first projector-equipped smartphone Samsung has released. The company released a very similar product back in 201o, also called the Beam. However, technology has advanced to the point where marketing a new, improved device is a viable business move for Samsung. The Beam ships with a specific app completely dedicated to the integrated projector. 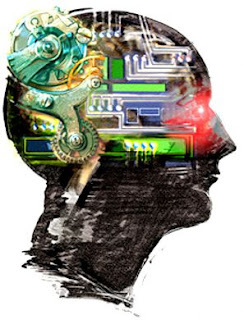 The app is used to select certain content and activate projection in a few steps. But the projector isn’t the only thing the Beam brings to the table. 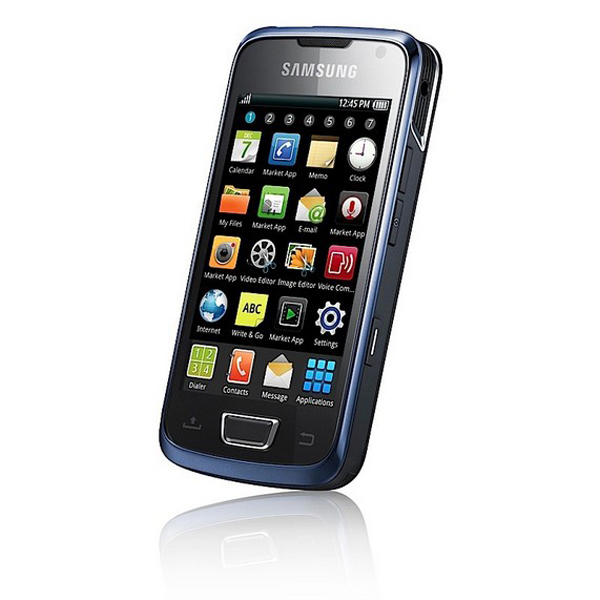 The device is powered by a dual-core 1GHz processor and comes with 8GB of storage and a microSD card slot. The screen is only 4″ and has a native 800 x 480 resolution. There is nothing too impressive about the Beam in terms of specs except for the rather surprising 6GB of RAM. A 5MP camera is also included for users who want to project their very own content whenever and wherever they want to that also records in 720p HD, which isn’t too shabby. Overall, the device is also very portable, only weighing 5.1 ounces and measuring 1.25cm thick. The Beam will initially ship in Sweden in July for $570. Samsung did not immediately comment on availability and pricing outside of Sweden so keep your eyes and ears locked here for all the details. Macworld | iWorld 2012 saw imaging company Epson set up a large area on the second floor in order to debut its newest product, the MegaPlex Digital Dock Projector. Epson is known primarily for its projectors and projector technology, as well as for its printers and printer technology. However, the MegaPlex Digital Dock Projector is the company’s first technology that is completely driven by an iOS device. The MegaPlex Digital Dock Projector is your average portable projector with its specialty being that it also comes complete with an iOS dock connector on the back. This allows you to plug in your iPad, iPhone, iPod or other iDevice into the dock, which then allows any app that allows you to send video to be projected onto a large screen, wall or any flat surface. Epson will be offering two different versions of the MegaPlex Digital Dock Projector, one priced at $699 and one priced at $799. The main difference is in the display quality. The more expensive model will feature a 720p HD video output at 2,800 lumens with the cheaper model offering 540p video output at 2,200 lumens. In addition to that, there is a panel of standard video inputs on the side which includes RCA, S-Video, VGA and HDMI. This allows you to connect nearly any type of device to the projector, like a laptop or desktop computer. One downside is the lack of a handle, which limits the portability of the device though it is still very good for showing movies or presentations directly from an iOS device. There is, unfortunately, no audio out to hook up to an external speaker. You could just as easily use the audio jack on the iOS device that you have connected but then it would lack the professionalism and clean look that you may want. Regardless, there is still something cool about seeing an iPad projected on a wall. If you are looking for a low cost projector that comes complete with iOS integration, this may be the device that you are looking for. 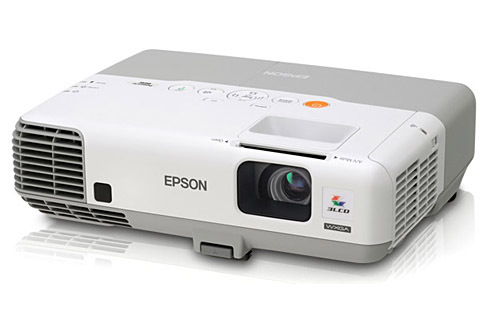 Epson’s new PowerLite 96W is a nice multimedia projector designed with the classroom or meeting room in mind. There are a lot of different features on the projector that make it perfect for any type of presentation situation and it even has the ability to be connected to a LAN, run presentations from a USB drive or control other projectors connected to the same internet network. The light source for this projector, which is based on the 3LCD technology that Epson pioneered, outputs 2,700 lumens while the projector also provides a WXGA resolution with a 16:10 aspect ratio. Physical dimensions of the device measure 4.2″ x 13.6″ x 10.3″ with the projector weighing in at 7.2lbs. The projector also features a manual focus as well as zoom wheels that you can access via an indention above the lens. There are also a ton of ports on this device too. All in all, the PowerLite 96W comes with VGA-in (2), monitor-out VGA (1), HDMI-in (1), RCA (3) for Composite Video and Audio, S-Vide0 (1), USB (1), RS-232 (1), Ethernet (1) and microphone jack (1). This should cover pretty much anything you need to do with this device but if not, I’m sure there is an adapter out there somewhere. Reports on this projector note that this device is definitely made for viewing still images and not long video clips. It does seem to handle short video clips ok but screening a full-length movie would not be advisable due to loss of detail over time and posterization. Sound quality is also adequate with the device’s built-in 16W speaker. With all the connectivity options, as well as internet connectivity via LAN or WiFi and the ability to accept input from multiple computers, the PowerLite 96W is a fairly good projector for use in small or medium meeting rooms as well as classrooms. Presentations run smoothly and the ability to play a few video clips just adds to the accessibility of the overall product. Epson, one of the leaders in projector sales worldwide, has just announced an expansion to its highly popular PowerLite Pro Z Series of projectors. The expansion consists of five all-new projectors, all of which were designed for use in corporate markets, higher education, houses of worship, rental and staging, museum and digital signage applications. All of the new projectors deliver advanced image quality, connectivity and installation tools and all five projectors also have an expanded feature set with edge blending, split screen capabilities as well as DICOM Simulation Mode(2). The design and features of these projectors are perfect for use with large or small audiences and are perfect for professional looking presentations. The five new projectors in the series consist of the PowerLite Pro Z8450WUNL, PowerLite Pro Z8455WUNL, PowerLite Pro Z8350WNL, PowerLite Pro Z8250NL and PowerLite Pro Z8255NL. Each projector has a fairly high lumen output with the Z8450WUNL and Z8455WUNL displaying 7,000 lumens with a WUXGA resollution, the Z8350WNL displaying 8,000 lumens with a WXGA resolution and the Z8250NL and Z8255NL displaying 10,000 lumens with a XGA resolution, making them perfect for any professional setting. The Digital Media Division, Business Solutions Group from Hitachi America has just introduced the company’s newest product, the brand new Installation Series of projectors. The Installation Series projectors all come with two HDMI ports, addressing the increased demand from projector users for digital connectivity. In addition to that, this series of projectors features motorized focus, zoom and lens shift which allow for easy adjustments to your picture. What’s more is that each of the projectors in the series will also include a 360-degree off-axis display and will be equipped with a high-performance filter that lasts up to 20,000 hours without cleaning. A new feature for Hitachi that is incorporated into the Installation Series is an Operation Log Recorder. This feature allows the user to access all the internal statuses and server conditions of the projector, ensuring that you are always running at the highest performance rate possible. Four optional, interchangeable lenses are also available for the Installation Series that accommodate for different throw distances. A large lens shift also allows users to readjust the position of the image to fit the screen perfectly. In addition to that, the Installation Series’ center lens design makes it very simple to align the projector with the screen. Hitachi offers a slimmer design with the Installation Series, as well as two 8-watt speakers, and digital keystone and Perfect Fit also make it easy to properly position the image. These projectors also offer Versa-Stack, enabling the seamless stacking of two projectors via RS-232 connection. Other features of the Installation Series include DICOM Simulation Mode and an optional wireless adapter with support for 802.11 b/g wireless and the latest 11n via a USB adapter. The DICOM Simulation Mode is perfect for viewing grayscale medical images, like x-rays, for training and educational purposes. Are you looking for a quick and easy projector for your next business meeting? If so, you should consider Rentacomputer.com’s full line of Meeting Projector Rentals. These projector rentals are specifically designed with business meetings in mind and may be the perfect solution if you need a projector for a business meeting and you don’t want to go out and buy a brand new one. Oftentimes, small business meetings are set in closed and intimate settings and don’t necessarily give you a lot of free space. In situations like these, smaller projectors are ideal since they save you a lot of room and can project large images from very short distances. Rentacomputer.com offers a cornucopia of projector rentals that are perfect for your next business meeting. Such projector models include 2,000 lumen, 5,000 lumen or 10,000 lumen projectors, large venue projectors, DVD video projectors, short throw projectors and even PowerPoint projectors. Short throw projectors are perfect for meetings because they allow you to project large images from directly in front of the screen so your projector isn’t half way across the room. This allows more space for your audience as well as a more comfortable environment for everyone in the meeting. PowerPoint projectors are projectors that are specifically designed to connect to a laptop or a computer and project your custom PowerPoint presentation. You won’t have to mess with any settings, you won’t have to adjust anything, everything is already primed for any type of PowerPoint presentation. 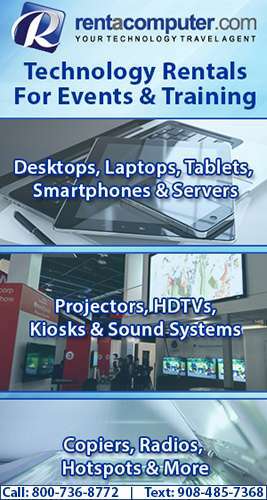 In addition to having a plethora of different projector meeting rentals, Rentacomputer.com takes all the weight off of your shoulders in terms of logistics. When you order your projector from Rentacomputer.com, a local technician wherever you will be using your projector will personally deliver, set up and test all of your equipment to make sure it is all working. And when you’re done, that same technician will pick everything up. So the next time you find yourself in need of a projector for an important business meeting, consider a Meeting Projector Rental from Rentacomputer.com. Rentacomputer.com has over 25 years in the business of computer and technology rentals so you know that if you choose Rentacomputer.com you are choosing a name you can trust. One of the leading providers of digital projection and visual display products in the world, FAVI Entertainment, has just announced a brand new portable mini-projector that is capable of displaying images, as well as video, from a USB or SD card port. In addition to that, this device can connect to a number of other devices, such as an iPhone, iPod, iPad, laptop, desktop, DVD player, Blu-ray player or an Android tablet or smartphone. Known as the RioHD-LED-4, this mini-projector weighs in at under one pound and is an LED-based mini-projector, perfectly suited for use in business settings as well as for home entertainment. In addition to being extremely portable, this device is a featured product in the all new FAVI Projector Package for Apple AirPlay. The all-in-one package includes the RioHD-LED-4 projector and a portable, tabletop projector screen with carrying case. 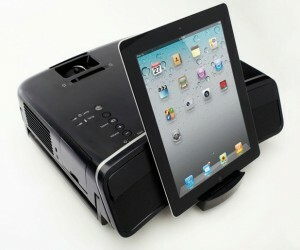 It also allows for wireless projection from an iPad 2 or iPhone 4S. The projector by itself, without the screen and the AirPlay package, will run you $299 and can be acquired exclusively via FAVI Entertainment’s website, Amazon.com or Retalice.com. FAVI Entertainment, in addition to projectors, also offers a full line of LCD and LED televisions, projector screens and accessories, ensuring that you can get everything you need from just one manufacturer.